Exercise is an important part of healthy living for everyone; it is a vital component to maintaining balance, mobility and activities of daily living. Benefits can include improved endurance and energy levels, lower health risks such as high blood pressure, heart disease and diabetes, better balance, posture and memory, boost in mood, increased muscle strength and so much more! Our classes are appropriate for all levels of ability and do not require registration. 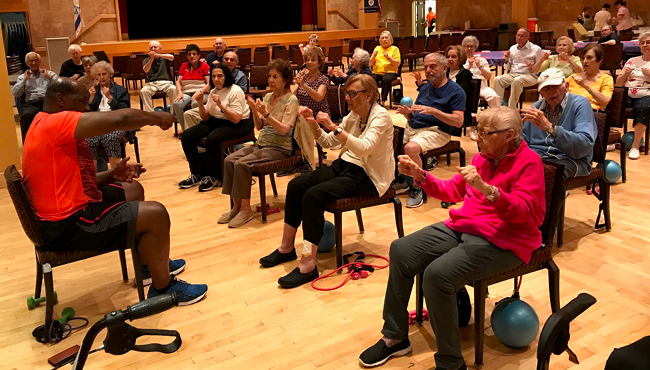 Class offerings include Boxing for Seniors, Cardio Dance Party, Fit for Life, Balance and Agility and more. Join us for one or all seven of our wide array of programs.